The much-anticipated Air Jordan 10 “Chicago” already hit the market and is creating a lot of buzz right now because of its sales. 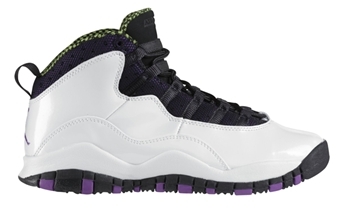 Aside from the “Chicago” edition of the Air Jordan 10, Jordan Brand also released another edition of the shoe called Air Jordan 10 GS “Violet Pop”, which also looks very impressive. The White/Violet Pop-Cyber-Black colorway of the Air Jordan 10 GS is a surprise package from JB this month for it was expected to be release sometime in February or March. This is a good alternative for the “Chicago” edition for grade school peeps out there!